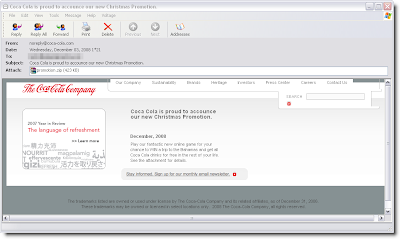 Subject: Coca Cola is proud to accounce our new Christmas Promotion. Coca Cola is proud to accounce our new Christmas Promotion. Play our fantastic new online game for your chance to WIN a trip to the Bahamas and get all Coca Cola drinks for free in the rest of your life. See the attachment for details. The trademarks listed are owned or used under license by The Coca-Cola Company and its related affiliates, as of December 31, 2006. These trademarks may be owned or licensed in select locations only. © 2008 The Coca-Cola Company, all rights reserved.